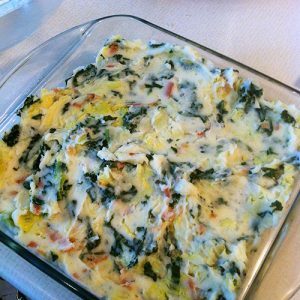 In this recipe installment, I wanted to share Colcannon (cál ceannann). Mashed potato and cabbage might not readily appeal to you, but I highly recommend it (and so does Jienny! See page 2 of Chapter 3). On top of that, the superstitions surrounding the dish are quite interesting. 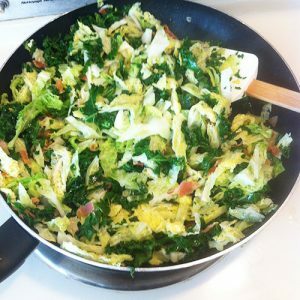 Mmm, cabbage, kale, and bacon! A simple recipe combining two staples that someone could get their hands on even in winter, it took on a special meaning on Samhain, the Celtic festival that marked the end of harvest time. Among many other customs, people would (and still do) gather as a household to try to divine each other’s future. Food was often the tool employed. When making colcannon, a person would hide small objects inside. The item each guest received in their serving was supposed to reveal their fortune. Another ritual involved putting the first and last spoonful of colcannon in your stockings and hanging them on or near the front door. The belief ran that the next man through the door would be your future husband. Depending on the source, only the girl who received the ring would do this. Other sources say this was a practice for any girl hoping to marry. But the dish can–and should–be enjoyed anytime, perhaps alongside a hearty stew, some sausage or a roast. My favorite variation involves frying several chopped up strips of bacon along with the greens (which you can see in the pictures). Who could say no to that? Cut large potatoes in quarters and bring to boil in a large saucepan of water. Boil until flesh is tender, about 15 minutes. You can peel the potatoes before boiling, but some like the trick of just washing them well and then boiling them with skins on, after which the skins come off much easier in an ice bath. Whatever you choose to do, you want to end up with three peeled, boiled, and drained potatoes. While the potatoes boil, melt two tablespoons of the butter in a frying pan and fry the vegetables and bacon together until bacon is cooked and veg is wilted. Set aside. Mash potato until smooth. Heat the cream with the remaining 4 tablespoons of butter in a small saucepan, and just as it starts to boil, remove it from the heat and beat it into the mashed potato. Add the veggie/bacon mixture and mix together. Some recipes say to finish it by browning the top under the broiler. I used half kale and half cabbage. I find it hard to find acceptable ways to use kale and this is one of them. Martha Stewart’s recipe also includes leeks, which would probably be amazing. You could also fry up heaping spoonfuls into colcannon cakes for breakfast. As always, I would love to hear about your own variation of colcannon, or what you think if you try the recipe!